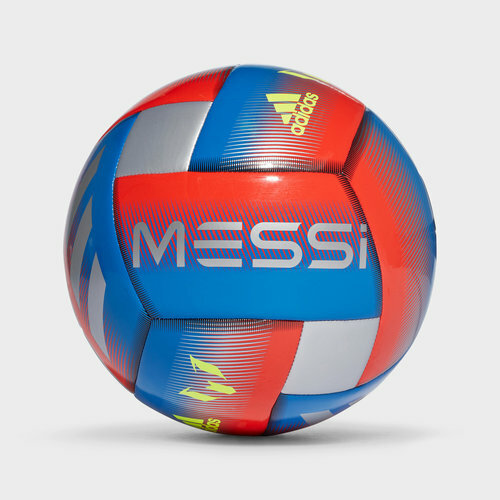 Regarded as the best player in the world and by many as the greatest of all time play like your hero with this adidas Messi Capitano Training Football in a Football Blue, Active Red and Silver Metallic colourway. Lionel Messi has won a record-tying five Ballon d'Or awards and a record five European Golden Shoes. He has spent his entire professional career with Barcelona, where he has won 32 trophies, including nine La Liga titles, four UEFA Champions League titles, and six Copas del Rey. He is both a prolific goalscorer and a creative playmaker, Messi holds the records for the most official goals scored in La Liga (399), a La Liga season (50), a club football season in Europe (73), a calendar year (91), El Clásico (26), most hat-tricks in the UEFA Champions League (8), as well as those for most assists in La Liga (159) and the Copa América (11). It comes as no surprise that every footballer wants to play like Messi or have his success. This training football has been crafted with a whole lot of Mesi style and is hard-wearing, built for training and recreational use. The ball has been designed by German sports brand adidas who have machine stitched the TPU cover to add durability. The butyl bladders keeps the ball inflated and maintains its shape remaining 100% ready for action.